Herbal therapy is an important branch of Traditional East Asian Medicine, with a history of at least several thousand years. There are more than 400 commonly used herbs within the Materia Medica, and they are usually administered in carefully crafted formulas of 5-15 herbs. Herbal formulas can be used to nourish and support the body or rid the body of disease, often simultaneously. Herbal medicine is powerful in its ability to treat chronic and advanced conditions, and can also be used for acute issues, always taking into consideration each individual’s underlying constitution. Herbal formulas can be taken in the form of tea made from bulk or granulated herbs, as well as in capsules or pills. For some conditions, external herbal patches or soaks may be used as well. Herbal formulas work hand-in-hand with acupuncture, and their combined effect is more powerful than when either is used alone. Acupuncture works through repetition, and taking herbs on a daily basis helps reinforce the acupuncture, often allowing for fewer treatments and a more affordable treatment plan. The value of herbal medicine has been understood and appreciated since ancient times, but as in acupuncture and many aspects of Western medicine, how it works from a biomedical framework is not well understood. Each herb includes numerous biochemical components, and the synergy and balance of multiple herbs within a formula ultimately creates its therapeutic effect. 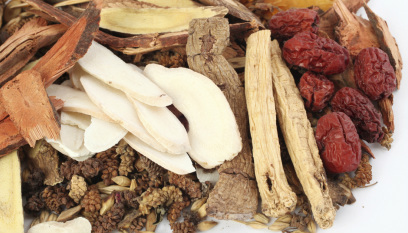 Thus, identification of chemical compounds within specific herbs has helped to explain their physiological impact, but doesn’t completely define Traditional East Asian herbal medicine. There is a growing body of observational research into herbal therapy demonstrating its effectiveness, and scientists are continuing to study it from a pharmacological perspective.